TigerChef Large Stainless Steel Mesh Sink Strainer 4-1/2"
TigerChef > Restaurant Equipment > Commercial Sinks and Faucets > Restaurant Sinks >< Sink Strainers > TigerChef Large Stainless Steel Mesh Sink Strainer 4-1/2"
✔ Extra fine mesh lining ✔ Rust resistant ✔ Collects sink debris for easy disposal ✔ Dimensions: 4-1/2" ; Inner Dia. : 2-1/2"
$1.09 TigerChef Medium Stainless Steel Mesh Sink Strainer 2-3/4"
$19.99 Win-Holt WS-BD-15ST Win-Fab Basket Drain 1-1/2"
$32.99 Win-Holt WS-BD-35ST Win-Fab Basket Drain 3-1/2"
$0.99 TigerChef Stainless Steel Strainer 3-1/2"
$0.89 TigerChef Small Stainless Steel Mesh Sink Strainer 2"
$1.09 TigerChef Stainless Steel Basket Strainer 3"
$0.84 Winco SIK-3 Sink Strainer with Stopper 3"
The TigerChef Large Stainless Steel Mesh Sink Strainer 4-1/2" is designed to eliminate unwanted food residue in your sink and keep the drain flowing freely. 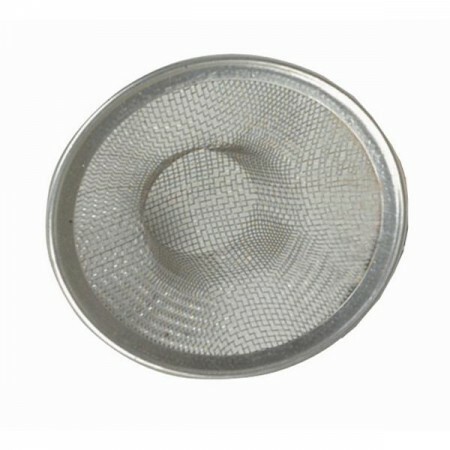 Featuring a fine mesh lining, this strainer will catch even the smallest particles of food debris. This sink strainer is made from durable stainless steel and is rust resistant for lasting performance. Dimensions: 4-1/2" ; Inner Dia. : 2-1/2"